The internet is a marvelous thing. Yes, I could live without it, but life would be dull and I’d be dumb, because I couldn’t quickly Google things like “quantum mechanics” and discuss Schrödinger’s Cat thought experiment at a cocktail party a few hours afterwards. I’ve come to love the surprises StumbleUpon has given me, and one was a link to Use Real Butter’s website and to the recipe Espresso Chocolate Chip Shortbread. Use Real Butter got the recipe from Smitten Kitchen. And now, I give it to you. You must click their links because their pictures are beautiful. As clever as the internet makes me, it has NOT made me a fine photographer yet. You have to read what I have to say first, then I’ll give you the recipe. If you scroll to get the recipe without reading me, I’ll know. Oh yes. I’ll know. (Thumps rolling pin in intimidating manner in open palm). Today’s post is inspired by my need to provide cookies for a family reunion this coming Sunday. I can’t have a blog called Walsh Cooks and run out to M & M’s for a box of frozen squares. Okay, yes, I can. Today is Remembrance Day, and the men and women who sacrificed their lives for our freedom, did that so I can shop at M & M’s if I want to. Back to the internet being a marvelous thing. As you will read in the recipe, it instructs us to roll out the dough in a large zip-lock bag. Now, isn’t that a great idea? Not only will it be in the nice rectangular shape you want, you won’t be able to eat the dough while rolling it out. And the best part? Zip it closed to store in the fridge until you want to bake it! Amazing! 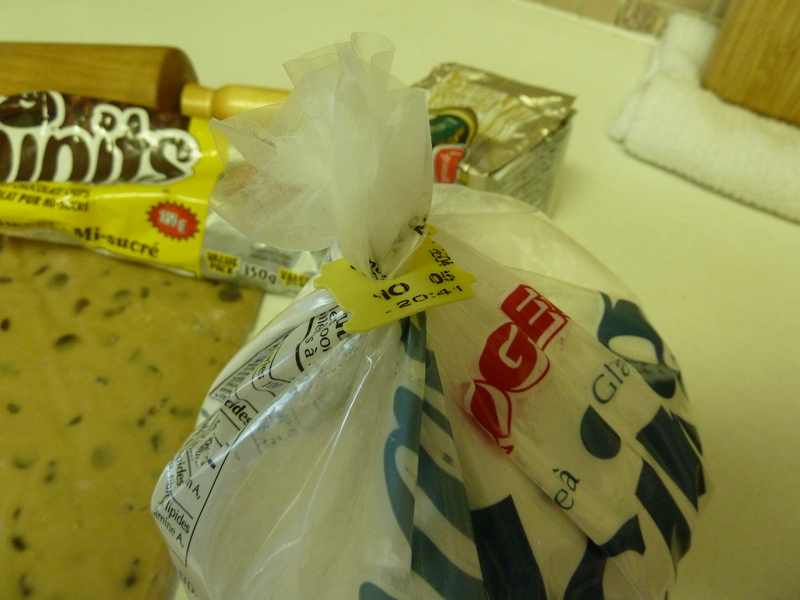 A Zip-Lock Bag with the shortbread dough. No mess! It's rectangular! Now, my contribution to the internet is closing open bags. Once upon a time it seemed we had drawers full of twist ties. You’d find them everywhere in our house. But with the raising popularity of the zip-lock bag, it is getting harder and harder to find a twist-tie. For many years, I’d use tape to keep bags closed. Scotch tape, masking tape, even duct tape, but as you can surmise it is not that practical for bags that you need to open fairly regularly. My brilliant husband one day had the idea to save plastic bread bag tags. We go through a lot of bags of bread in our house as we are NOT of the mindset that bread is evil. So we have accumulated a lot of bread bag tags. They work perfectly to keep bags of icing sugar, bags of frozen peas, and bags of bread bag tags closed nice and snug. Bread Bag Tag Keeping Icing Sugar Bag Closed. Yes, I trust it enough to not have a failure. I would NOT recommend tossing it like a football though. And now, what you have been waiting for: the recipe. As I write this post, my dough is chilling in the refrigerator. No need, I’m sure, to wait to write about how it turns out. It’s made with a cup of butter, sugar and chocolate. It is impossible to fail. Dissolve espresso powder in boiling water. Set aside to cool to tepid. Beat butter and confectioners’ sugar together on medium speed for about 3 minutes, until the mixture is very smooth. Beat in vanilla and espresso, then reduce mixer speed to low and add flour, mixing only until it disappears into the dough. Don’t work the dough much once the flour is incorporated. Fold in the chopped chocolate or chips with a sturdy rubber spatula. 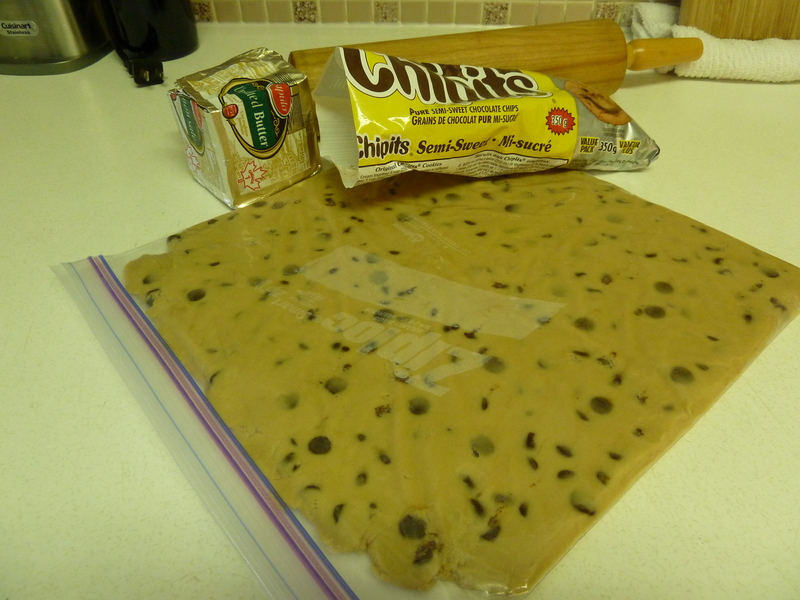 Using the spatula, transfer dough to a large-size Zip-Loc bag. Put bag on a flat surface, leaving the top open, and roll the dough into a 9 x 10 1/2 inch rectangle that’s 1/4 inch thick. As you roll, turn the bag occasionally and lift the plastic from the dough so it doesn’t cause creases. Transfer the squares to the baking sheets and carefully prick each one twice with a fork, gently pushing the tines through the cookies until they hit the sheet (Use Real Butter does not poke the cookies and they’re fine) (Walsh Cooks here: What does the poking do anyway?). Bake for 18 to 20 minutes, rotating the sheets from top to bottom and front to back at the midway point (or do one sheet at a time). The shortbreads will be very pale–they shouldn’t take on much color. Transfer the cookies to a rack. If you’d like, and don’t mind the mess, dust the cookies with confectioners’ sugar while they are still hot. Cool the cookies to room temperature before serving. Makes about 3 dozen.